Most Name Plates Shipped in 1-2 Business Days. Welcome to the web’s leading source for name plates. We offer dozens of designs. From our low-cost XpressPlates to our award-winning Obsidian Series, you can see why thousands of organizations order their nameplates from us. Our mission is to make it easy to order desk name plates. There are no hidden charges for extra lines of text or your logo. Our online wizards let you see your design before your buy. Aluminum nameplates are tough. Design online or upload your own design. Our Office Pal™ Desk Signs are engraved on both sides and are available in 16 designer colors in over 30 different designs. We offer the largest collection of colorful, designer nameplate templates - pick a floral design or an abstract print. Assorted name plate holders in sizes 2"x8", 2"x10" & 2"x12". Available in many colors & materials. • Sizes from 2"x8" - 2" x 12"
• Variety of plate holders available. • Sizes from 2"x8" - 2"x10"
•Choose from 3 standard sizes and 12 different colors for these rotary engraved plates. • A solid stone plate with a polished, mirror-like, obsidian front surface. • Original wood-grained, engraved plate, set on a solid block of walnut. • Upload a photo or choose one of our creative designs to add style to your office. • A solid wood bar offsets a Lucite front plate to announce your arrival. • Glossy gold or silver plate in durable plastic, with an all-metal frame. • Polished wood brass with gold touches. Base is protected with felt. 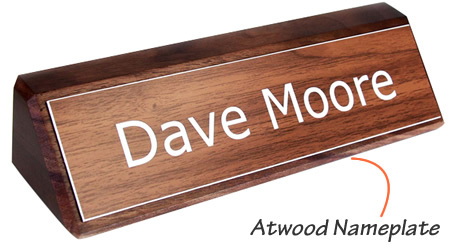 • Rosewood nameplate with a polished finish, and a slot for business cards. 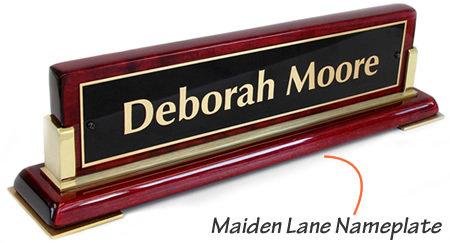 • A premium wood, elegant desk nameplate. Gold trim and a polished finish. • Etch your name on smoked glass with side aluminum accents. • Customized and etched, premium glass. Prism-shape with a star accent. • Includes everything in one kit to make your own cubicle or desk signs. • Need to get a message across? Create a sign in a snap, in over 40 sizes. • Order badges with full color photos and logos or low-cost engraved badges. 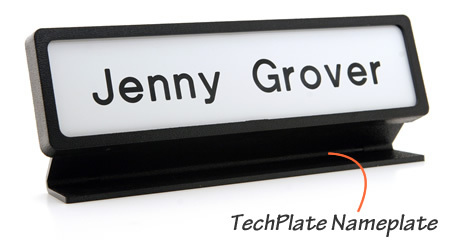 • Lighten up the mood in the office with these funny nameplates, available in various colors. Makes great gag gifts! • Double-sided, and rests on a soft cork base. Displays an identical or unique message on each side. Very nice, very professional, sturdy. I ordered this as a birthday gift for a young colleague and she should be able to use it for the rest of her life! ARRIVED ON THE EARLIEST EXPECTED DATE AND LOOKED GREAT. It was lovely and he was very happy with it. I have ordered these in the past, in fact every two years as our local election year brings about some changes. Also timely and exactly as ordered.